The Sig P938 is a sub-compact 9 mm pistol with a great reputation as a carry weapon. The small size and dependable accuracy make it ideal for carrying discreetly with enough stopping power to save lives in an emergency. Not all holsters fit every gun, and one-size-fits-all can be a dangerous road to go down. Lucky for you, Gun Goals has come up with 5 of the best holsters for the SIG P938. Read on to decide which fits your style and budget. As with any time you buy new firearms gear, you need to start with knowledge on the products in general. Good features for holsters can be applied to ones built for the Sig Sauer P938. By knowing what makes a good holster, you can apply that knowledge when you read about our top 5 holsters below. When you carry, you expect to be ready in an emergency situation. We all hope we never find ourselves in danger, but we like to be prepared just in case. A good holster allows you to grip the handgun easily and draw it with maximum speed. A few microseconds of delay can mean the difference between life and death. For many, this is one of the most important features when picking a holster. Check out this video for more information on how to draw from IWB. Retention systems on holsters come in different varieties from simple friction to several mechanisms locking the handgun in place. Retention serves the purpose of not only keeping the gun in the holster and in place but also preventing someone from grabbing the gun out of your holster. If you’re concerned about holster grabs, a higher level retention may be for you. If you’re unsure what you need, check out USA Carry’s article on the topic. Holsters come in four main types of material. Leather – Leather holsters have a classic look and are well-known for being durable and comfortable. They do well in most weather situations and are easy on the gun. However, they usually cost more and require some breaking in. Synthetic – Synthetic holsters are made from polymer, usually Kydex. There are known for keeping their shape over a long period and being protected from moisture and weather. Their downsides include being less comfortable and harder on the gun. Hybrid – Hybrid holster combine leather and synthetic elements. Usually, the shell holding the handgun is Kydex and the shield between you and the holster is leather. Because of this extra feature, these usually cost a bit more. Cloth/Nylon – Cloth/nylon holsters are very cheap and comfortable. However, they don’t hold weight well, tend to sag, and come apart quickly. We don’t recommend this for holsters usually. The way the holster hooks to your belt is important too. If the holster doesn’t sit close to your body, it raises the level of discomfort and makes it harder to draw. It largely depends on your preference which you use. Some holster manufacturers let you swap out the attachment types for another. In general, the more clips or loops, the more secure the holster but the more you notice it’s there. If you don’t know which kind to use, I recommend starting with the clips. They are easy to use and secure. 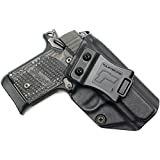 One of the common reasons people want to carry but don’t is that they find it uncomfortable to wear the holster through their day to day activities. It doesn’t have to be this way. Many holsters (including the ones on our top 5 list) are made from smooth material that moves with your body. Often, high-quality holsters offer some level of adjustment abilities. You can carry in different positions at different cant (angles) and ride heights as you prefer. As always, cost is a factor when shopping. You can spend a lot of money on the fanciest holster in the world, but if it doesn’t fit you right, it’s all a waste. Each product on our top 5 list is affordable at different levels and worth the price. But if you’re looking to buy multiple holsters or more gear, you can probably get away with one of the more affordable options on the list. Keep these features in mind as you choose the best holster for your SIG P938. Each holster has its own pros and cons that separate them from the rest of the crowd. Look at our breakdowns below to help you decide. FITS - Sig Sauer P238 and Sig Sauer P938 like a glove! Don't settle for cheap leather! The 1791 IWB holster is one of the top choices for concealed carry for the P398. With an average price point, the holster is designed to be soft and tough right from first use. The double stitched and reinforced steer hide leather is durable and holds its shape well over time. The low profile fits sleekly inside your waistband for easy concealment. A steel clip secures the holster to your belt discreetly. With a Level 1 retention, the IWB holster tries to optimize draw speed and easy access. This holster was constructed with the Sig Sauer P938 specifically in mind. They claim it fits like a glove. 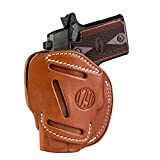 This particular holster is a right-hand draw, so if you’re a lefty you may want to look for another holster that’s either ambidextrous or comes in a different hand. As with most leather holsters, this is built to last a long time. 1791 Gunleather offers a lifetime warranty on this holster. Their craftsmen make the holster by hand using American-made materials all assembled in America. VERSATILITY: The 3 WAY holster allows for 3 different CCW positions. The holes on both side of the holster allow for Right or Left Handed OWB carry in 3 different positions. Great if you Cross Draw! Where the IWB holster listed before was very specifically designed, this 3-way ambidextrous holster is built with user choice in mind. The price range is a little higher than the other 1791 Gunleather, above average but not expensive. If you’re looking for an OWB for you P938, this may be for you. It can be worn right or left-handed in three different positions. Despite its adaptability and over-the-waistband usage, the 3-way holster is low profile enough to conceal easily. According to 1791 Gunleather, the leather is soft yet durable, and its special size for subcompact pistols gives it good retention and draw speed. The look of the material is classic leather, and it comes in three different colors: stealth black, signature brown, and classic brown. Like other products by this company, the high-quality leather is double stitched and 100% American made. They also give their standard lifetime warranty. This Concealment Express holster is another one made with the SIg P938 in mind. It can be carried four different ways IWB: Appendix, Hip, Cross-Draw, and Palm-in back. The Kydex polymer material is known to be one of the best synthetic materials on the market for holsters. It keeps its shape well and is durable in many weather situations. You don’t have to be as afraid to carry in the rain. The IWB holster has adjustable retention and cant (0-15 degrees). The adjustments are made by using a Phillips screwdriver and gives you more control over how you want to wear your gun. Concealment Express cuts down on the material to provide a low profile for optimal concealment. The holster attaches to your belt with a synthetic clip and comes in two styles: black and carbon fiber black. With a Posi “Click” Audible Retention System, your gun is safe from close-quarters grabbing. 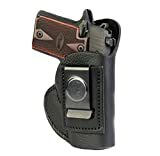 The manufacturer offers this affordable holster an unconditional lifetime warranty on its American made product. Alien Gear designed this IWB with comfort and adjustability in mind. With two belt clips securing the holster to your belt, it won’t move from its position. The ride height, cant, and retention are all easily adjustable to fit your body shape and carrying preferences. Alien Gear made the backing fabric from the company’s CoolVent neoprene. The perforated layer claims to pull sweat away from your body while offering a comfortable, cushioning feel. A shell holding your handgun that is specially molded for each size of pistol makes this size ideal for the Sig Sauer P938. The core is made from spring steel and ballistic nylon. This keeps the holster firm but flexible over time. Alien Gear offers a lifetime warranty and 30-day trial period on this more expensive holster, so you may want to give it a try anyway. It doesn’t come in different styles, but the holster does have a left and right-handed option. Adjustable cant (angle) from 0-30 degrees. Forward hole is oblong to allow for you to choose any angle between 0-30 degrees. The Sig P938 IWB Profile Holster is the most expensive on our list, but don’t let that scare you away. It comes with several great features that make up for that cost. The polymer holster is molded specifically for the P938 with the goal of no holster wear on your pistol. It isn’t until the handgun reaches its retention point the there is appropriate pressure in place, locking the gun with a soft click. The retention is easily adjustable using a Phillips screwdriver. The cant also adjusts from 0-30 degrees making this the most angle adjusted holster on the list. Tulster cuts down the material to give you a quicker and easier draw, lower profile, and lighter weight. Tulster added a sweat shield between the gun and your body to provide you more comfort and your pistol more protection from moisture. The IWB holster can be further adjusted by swapping out the 1.5-inch Quick Clip with different sizes or snapping belt loops if you prefer. The holster comes in right and left-handed varieties with a massive 12 different colors and styles. Does the customer experience live up to the hype? We hope you enjoyed our breakdowns of these great products. By thinking about what you’re looking for in a SIG P938 holster and reading the reviews above, you can make a successful purchase. If you can stand the extra cash, the Tulster holster offers a lot of adjustability for different body types. If you’re dead set on a leather holster, either 1791 Gunleather holsters have consistently positive results. Whether you carry open or concealed, these holsters are sure to meet your needs. If you enjoyed reading this article, you may also enjoy the Best Open Carry Holsters.